Buying a new leather saddle is an expensive and exciting investment for many horse riders. The first few times you ride in your new saddle, you may hear a significant amount of squeaking and noise because the saddle leather is not broken in. The key to getting rid of the squeaking is to break in the saddle leather properly. Breaking in the saddle will make it quieter and more comfortable to ride. A well made saddle is an investment that can be used for decades if it is cleaned correctly and maintained regularly. Clean your saddle thoroughly by rubbing it down with a high quality saddle soap and conditioning it using a good quality leather conditioner. 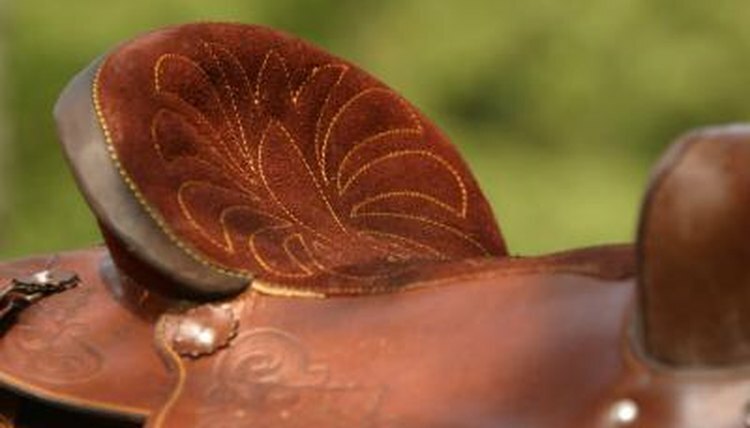 Use a sponge to rub conditioner all over the saddle and allow the saddle to absorb the conditioner. Make sure to get the conditioner into the rigging area as well as underneath the jockey at the top of the stirrup fender. Turn the saddle upside down and access the top of the stirrup fender where it attaches to the bar. Pour baby powder into the joint of the area. Adjust the position of the stirrup fender several times during this process to make sure that no area goes uncovered. Do this to both stirrup fenders. Put baby powder between the skirts of the saddle if they are rubbing together and squeaking. Ride in the saddle and condition it with leather conditioner after every ride. The more you ride in your saddle, the quieter you can expect it to be. A well-conditioned, regularly used saddle will quickly lose the new saddle squeak.  You can use pure neatsfoot oil to condition a saddle, but it may darken the color of the leather. You will want to avoid cleaning oils if you have a light color leather saddle and you want it to stay that color.  Soaking the entire saddle in water and then riding in it until it is dry is a quick method of breaking in a saddle. However, if you do this, then you need to make sure to thoroughly clean and condition the saddle afterward to put back the oils that the water will remove. Water stains leather saddles and will darken your saddle. It generally is not a good idea to submerge expensive, light color show saddles in water. This trick works best with simply designed, sturdy trail or working saddles.